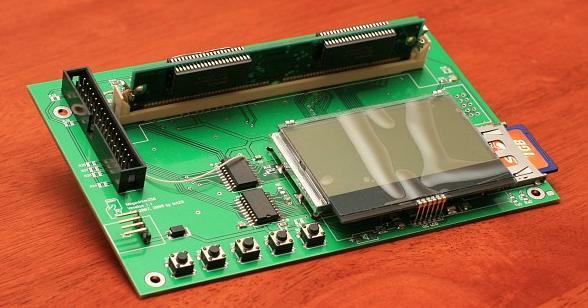 The emulator requires +5V for operation. Pay attention! Fifth button is used only for updating firmware from SD card. 1. "File Browser". This will be perhaps the most frequently used one. Browse through files/folders on your media with PREVIOUS and NEXT buttons, then select folder to open or disk image to be loaded with SELECT button. Typically, it takes the emulator 15-20 seconds to load a floppy image into RAM. Compressed floppy image formats, like Atari ST's .MSA, will take even more time due to additional processing work involved. 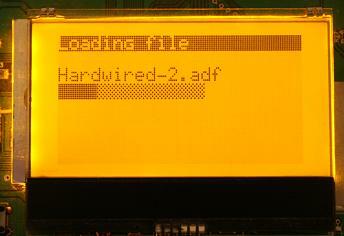 When loading is done, the emulator automatically switches to the "Floppy" screen. 2. "Floppy". This is the place where the emulator actually does its job. When browsing through other menues, the emulator will ignore the host completely, so it will look like there is no disk in drive. Entering this screen looks like inserting disk into virtual drive. 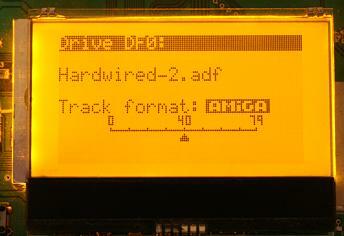 From now on, the emulator starts responding to direction and step commands, streaming MFM data to/from the host etc. Exiting the screen with EXIT button will also 'eject' the virtual disk. 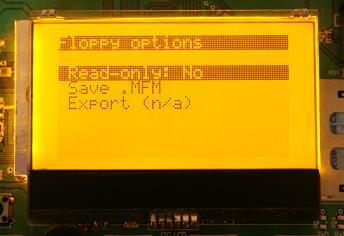 While in the floppy screen, there's a special 'Floppy Options' menu on SELECT button. It is currently used to save (or, rather, export) changes made to floppy image in RAM to flash media. The only format supported is custom .MFM format which is merely raw MFM bits. The size of the file will always be 2048K, and the name will either match the original loaded file name, or, if the image has been newly created (by entering the 'Floppy' screen directly without loading any floppy image) the name will be 'EMPTY.MFM'. In the latter case, the file will be saved in the root directory of flash card. 3. "Settings". Only two items here are meaningful currently, 'Host:' - set it to AMIGA for Amiga, choose PC for other host types; and 'Step click': which is self explanatory. Use PREV and NEXT buttons to select item, and SELECT button to cycle through the list of its values. EXIT button will exit the screen saving changes, if any. FAT32 is supported. I used 1GB and 2GB SD cards with the emulator, and it seemed to browse them just fine. IDE is not officially supported. 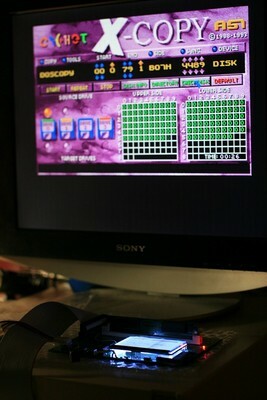 That is, I managed to read a couple of (old) CF cards attached to the IDE on my board, and really a few old HDD drives. So I decided not to focus on IDE. 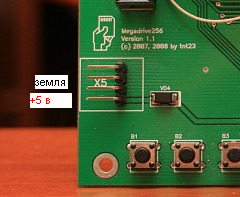 The IDE connector is even not soldered on most of the boards. 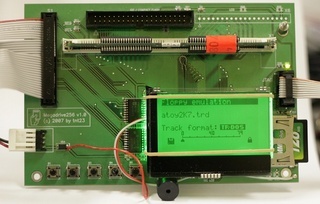 Still, the 'File browser' will list CF as possible file source, and you may solder the IDE connector in place if you really need it. 'RAW' mode is there all the time. In fact, when you enter "Floppy" screen with no floppy image selected, the screen will indicate "RAW" mode. 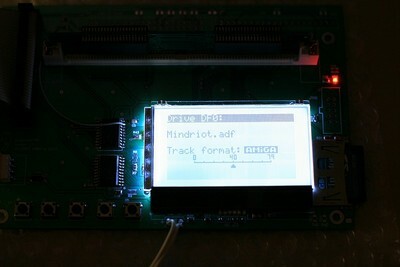 The emulator will accept whatever MFM bit stream the host sends to the floppy, and will also serve it back. As soon as the stream complies with MFM for DD standard it should be written and read OK. 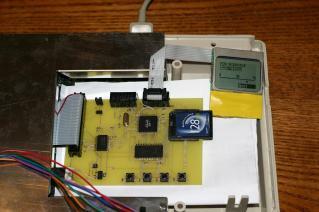 I've tested it with ZX Spectrum, PC, Atari ST, and some Russian PDP clones. Haven't got any SDHC to test it, unfortunately. The SD cards are dealt with in MMC mode, so if the SDHC supports one, chances are good for these. So far the biggest SD card I used was 2GB.